ITS Fire provide a wide range of fire alarms and detection solutions to businesses and commercial concerns. We also offer a wide range of Quality Fire Fighting Equipment and Emergency Lighting Systems together with Alarm Servicing, Monitoring and related fire protection services. Properly controlled, fire is essential to mankind but – when out of control – FIRE KILLS. We can help you ensure that your staff and premises are well protected and that your company fulfills its legal responsibilities by complying with the latest fire safety regulations. Browse our Site, learn about the different Fire Alarm Systems we offer together with information on current fire legislation. Contact us for no obligation quotations on your fire alarms and ancillary services requirements. 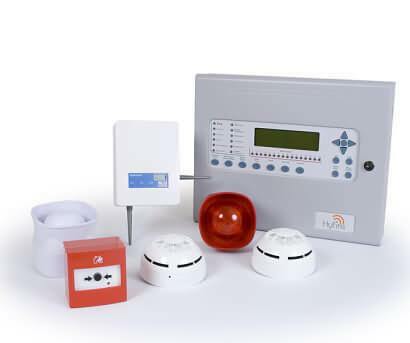 We offer Wireless Fire Alarms which require very little disruption when installing giving very cost effective protection. Radio Fire Alarms are also available can be cover wider areas. Our Quality Management Systems are registered to internationally recognised standards. for Design Installation, Commissioning/Handover and Maintenance of Fire Alarm Systems. We are a registered member of the Fire Industry Association. We supply and install a wide range of Fire Alarm System including Conventional, Addressable, Wireless and Radio. We offer service and maintenance contracts on new installs or for existing systems ensuring compliance to fire legislation. Providing guidance to exit paths in case of power failure. We can advise, supply, install and maintain your systems. We can supply and fit a range of quality, Fire Resistant doors to suite your requirements and meet all current fire legislation. We can arrange for your Fire Risk Assessments to be carried out and professionally documented. We can supply and fit a wide variety of compliant Fire and safety signs to help you meet your legal requirements.